One of the most successful cars of all time, the Ferrari F2004 was the fruit of the team's labours during its pomp - winning 15 of the 2004 season's 18 races in the hands of seven-time champion Michael Schumacher and Rubens Barrichello. Under the technical stewardship of Ross Brawn and Rory Byrne, Ferrari picked up from where the team's innovative 2003 car left off. The F2004 featured the sculpted sidepods and aerodynamic details that would become standard in the succeeding seasons, including the small sidepod flicks and periscope exhausts. The team had also revised the suspension geometry, learning lessons from the previous season where the car was prone to wearing out its Bridgestone tyres, and had beefed up its already-powerful V10 engine to devastating effect. Clinching a one-two finish first time out in Australia, the F2004 helped Schumacher and Barrichello lock out first and second on seven further occasions - proving to be miles ahead of the rest of the field. Schumacher clinched his fifth consecutive title at the Belgian Grand Prix with four rounds left to go, where Barrichello was the only other driver in mathematical contention. Ferrari swept to six constructors' titles in a row, ending the year on 262 points - 143 more than the second-placed BAR squad. An updated version also competed in the first two races of 2005, before making way for the F2005 - Ferrari's final V10-powered F1 car. 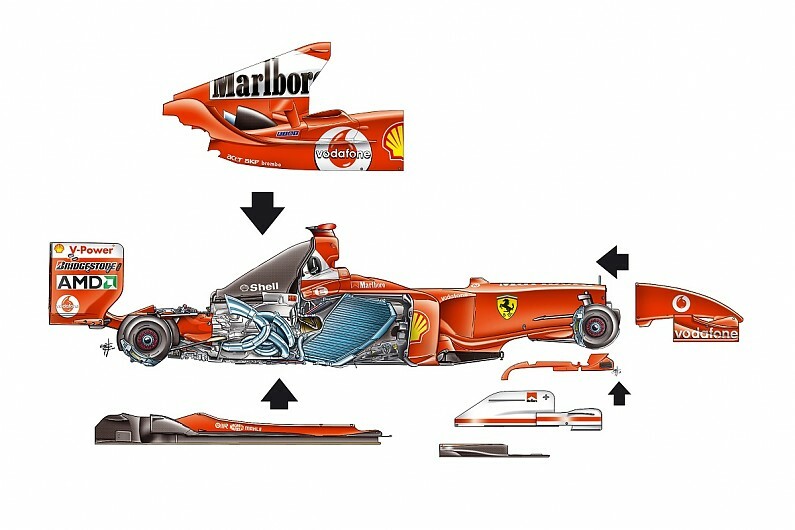 The Giorgio Piola print above showcases an exploded view of the F2004, featuring the internals - including the Ferrari V10 engine, exhaust manifold, intake and radiator all tightly packaged within the confines of the chassis. Ferrari's then-trademark drooping nose is also on show, along with the bargeboards, floor panel and wheel uprights. Not just a successful car, but also one of the most beautiful, Piola's illustration of the Ferrari F2004 is a must-have for any modern-day motorsport fanatic. This weekend, we're offering a print of the illustration as part of our biggest ever promotion - in which you can get a free trial of our Autosport Plus premium content, an iconic 1985 Ferrari F1 picture, a free copy of the next issue of F1 Racing magazine and a three-month subscription to Motorsport.tv.